Heavy Duty Constant Heat Sealer / Hot Bar Sealer is a validatable heat sealer that is ideal for industrial heat sealing applications - and laboratory testing of thermoplastic and laminated materials. Each constant heat sealer / hot bar sealer is available with a heat seal bar, heat seal platen or machined tooling for heat sealing contour shapes. 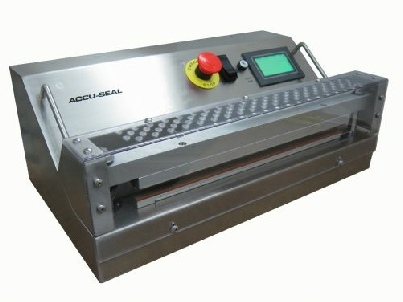 Two year warranty - heat sealer made in USA. User friendly password protection allows operator to select from pre-set and named seal recipes. Other standard features include: seal count, auto cycle and alarms for process faults. Seamless stainless steel case is standard and includes product support tray.
. Included with the machine is a detailed operating manual, spare parts kit and a two-year warranty - constant heat sealer made in USA. Constant heat sealers, hot bar sealers: for such materials like: humidity-proof cellophane film, aluminum foil, gusset bags and materials like PVC, foil Surlyn, Mylar and Tyvek pouches. Constant Heat / Hot Bar Sealers are excellent for high production heat sealing of pre-made pouches, of either Tyvek or foil. Many standard features to enhance production and ensure the highest level of process control. Full Digital temperature Control via PID with +/- 1 degree process controls provide the confidence all sealing process parameters are maintained Seal-to-Seal. • Available in 8”, 15” or 20” heat seal lengths - constant heat.